A group of community colleges in Southern California is working with Amazon Web Services and its education program to develop college credit courses for a cloud computing career pathway that starts in high school, continues through college and leads to industry certifications. The goal of the "CA Cloud Workforce Consortia" is to expand this common curriculum and develop a regional career pathway program and certificate. The concept has already been tested in one of those schools. 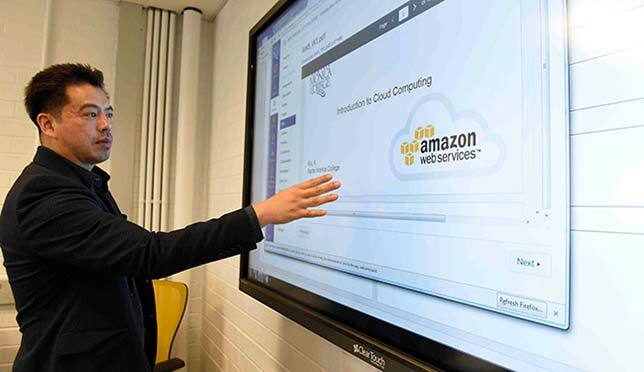 Santa Monica College piloted its cloud computing certificate in 2017, incorporating content from AWS and AWS Educate, Amazon's cloud-oriented learning site. The college worked with Roosevelt High School to offer dual enrollment opportunities during last year's school year. Student demand was so high, according to the college, SMC hired additional faculty and expanded the program from two sections to seven. Students take 15 units to learn about programming, database management, security and compute engines — all focused on AWS. That program was funded by California Community Colleges Chancellor's Office through the state's Strong Workforce Program, which allocated $200 million a year for the state's community colleges to grow and strengthen career technical education programs. Now 18 additional two-years colleges will join the initiative as soon as they get buy-off from the Chancellor's Office. As part of the effort, each institution will partner with at least one high school in the greater Los Angeles area, to offer concurrent enrollment in the program for secondary students. There will be an emphasis, in particular, on schools in poorer communities. In return, the schools will get professional development for their instructors, including help in curriculum development workshops and other AWS-related training. Santa Monica College computer science instructor Koda Kol teaches introduction to cloud computing course. Photo credit: Amy Gaskin. Students in the program will gain access to AWS Educate resources, such as "promotional credits" for use of AWS services on assignments and learning-related jobs; instructional content; microcredentials; and entrée to the AWS Educate Jobs Board. CA Cloud is also considering expanding the program into a two-year associate's degree dedicated to cloud computing and signing agreements with four-year institutions to provide pathways to bachelor's degrees. Eventually, the CA Cloud curriculum will be shared globally through AWS Educate as well, helping other schools and instructors to develop their own cloud computing educational programs. Training in cloud computing technology provides a potent antidote to under-employment. LinkedIn, for example, has named "cloud and distributed computing" among its top "hard" skills around the world for several years. Los Angeles County itself has identified 2,000 cloud-oriented job openings and expects that to continue over the next several years. "The recently developed 15 credit cloud computing certificate recognizes the importance of regional workforce development partnerships among Los Angeles area universities, community colleges, high schools and businesses," said Bill Scroggins, president of program participant Mt. San Antonio College, in a statement. "This collaborative effort...recognizes the importance of integrating technology skills into the training for today's workforce." Added LA Mayor, Eric Garcetti, "Los Angeles' economy is strongest when our workers are well-trained, our students have the skills needed to succeed in the 21st century, and our entrepreneurs can tap into a deep, diverse pool of local tech talent... CA Cloud will help us to cultivate the next generation of innovators by opening doors of opportunity to every young person who calls our region home."